Day 2 started with another Suja Greens. Allowing my body to have some nutritional consistency for the last day of expo was key because the last day requires some finesse. The last day is the day you account for the booths you missed, the vendors you'd like to meet and the resistance you're feeling between your mind/body connection. Your body is worn down, your mind is numb and you crave a couch BUT instead you pull from your reserves and make it past the finish line. "What runner's wall!" you proclaim LOUDLY! leaf cuisine / When you pair probiotics and cashew cheese in the same sentence, you have my full attention. I can appreciate a smooth, flavorful cashew cheese spread with a distinct probiotic tang. A good option for those times you want a lighter cashew cheese. 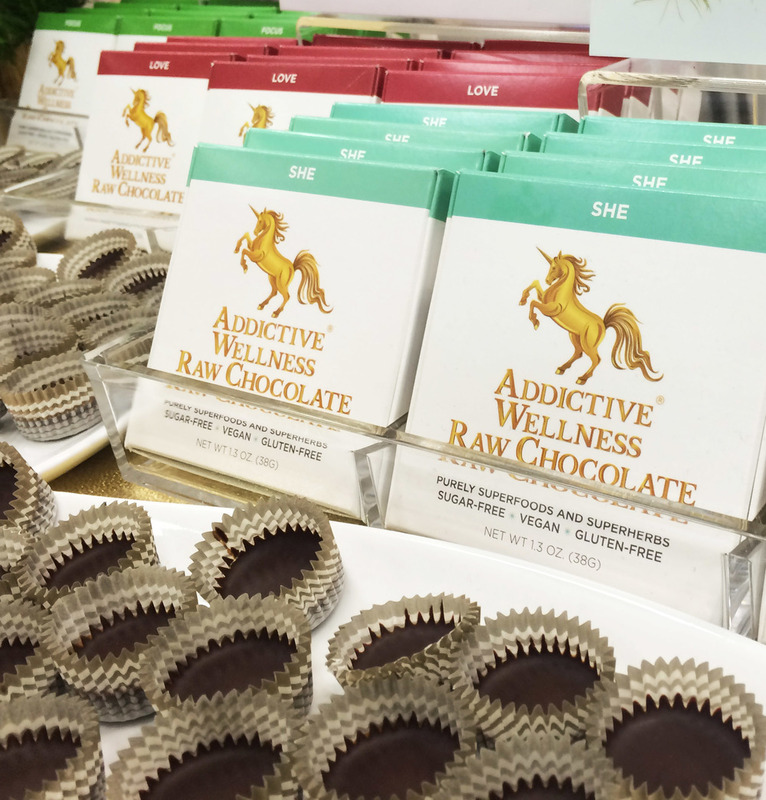 Addictive Wellness / I found Addictive Wellness a year ago when I was on a Candida diet; it was the only chocolate I was able to have that I liked. Each flavor has its own impressive list of superfood ingredients and herbs that you don't normally see as well as containing no sugar. Guilt-free morsels that curb any chocolate craving. Their 3 new flavors are; LOVE, SHE and FOCUS. OH YES! / When you get past the name, there's a delicious pizza underneath. I did not expect this pizza packed with 12 veggies and fruits to be as enjoyable as it was! It's perfect for kids, adults, college students...anyone with a mouth. They offer gluten-free and non gluten-free. The gluten-free was on point and their homemade cheese, ooey gooey and yummy. Pizza Party at my house! yumbutter / I fell for this company last year at expo. This year their booth was on point–I loved that most of my favorite booths used wood designed backdrops–and their new line of products irresistible. They introduced cashew, espresso and plant protein. That cashew. I had to walk away fast or their cashew demo would be no more. It was defreaknlicious. We are talking cashew butter, chia, hemp and goji berries. Match made in nut butter heaven. Organic Gemini / Again this was a great find last year and I've finally begun to see Tigernuts in our local Whole Foods. I'm still waiting for their drinks to debut in LA. Tigernuts are not actually nuts, but a small root vegetable. These little guys are packed with 40% of our daily recommended fiber! Jackson's Honest / I have three favorite chip companies and Jackson's Honest is one of them. To set themselves apart from the rest, they cook their ever-expanding list of potato and corn chips in organic coconut oil–no extra additives. I was allowed to preview their potential new line of almond flour chips! Let me just say, they are on to something! Five Star Foodies / I was so impressed with this booth, I texted my "squad" to meet me. Each burger sample was a well-envisioned dish. They showcased potential flavor pairings that would work on any restaurant menu. The team worked in unison to prepare each sample–their effort did not go unnoticed. The burgers themselves were outstanding. The ingredients klean and meticulously crafted. As someone who did not know this company existed before expo, I am beyond ecstatic to showcase them to my readers! Hope Foods / The variety of hummus options don't just range from typical to typical. No, they range from an exotic Thai Coconut Curry to a decadent Dark Chocolate–each flavor delicious, smooth and unique. This year Hope Foods unveiled another fantastic addition; Dairy-Free Frozen Desserts! They were out of this world yummy! 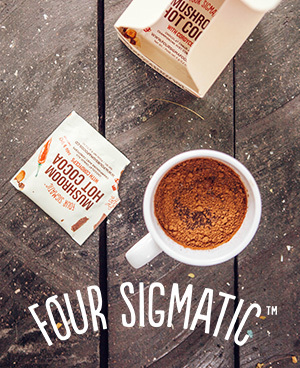 The dark cocoa chip was my personal favorite, but my partner-in-crime Vegangirl4ever was partial to the coffee dark cocoa chip. 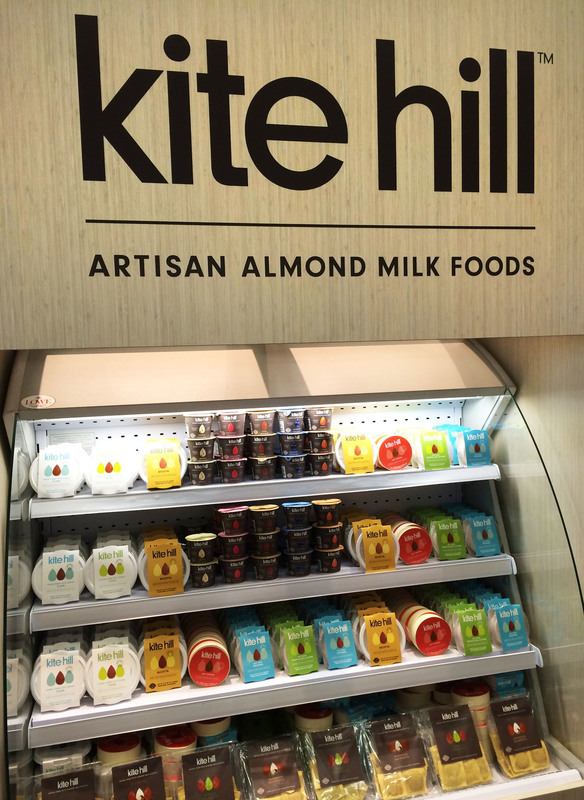 kite hill / Another innovative vegan cheese company at expo was kite hill. I'm fairly familiar with their cheeses, but some have escaped me. Kite Hill uses almond milk in lieu of the commonly used cashew. Their flavors are delicate (some like the ricotta is a little too delicate for my taste) and refined. I was hoping to try their pasta, but instead, they just teased me with a display. The Truffle, Dill, Chive spread was mouthwateringly delicious and the soft-ripened "brie" with rind was characteristically reminiscent to dairy brie. Beanfield's / One of my three favorite chip companies unveiled three more additions to their line; White Bean, Black Bean and Jalapeno Nacho. The chips are light, crispy, bold and simple. They contain a minimal amount of ingredients while still packing a punch in protein. 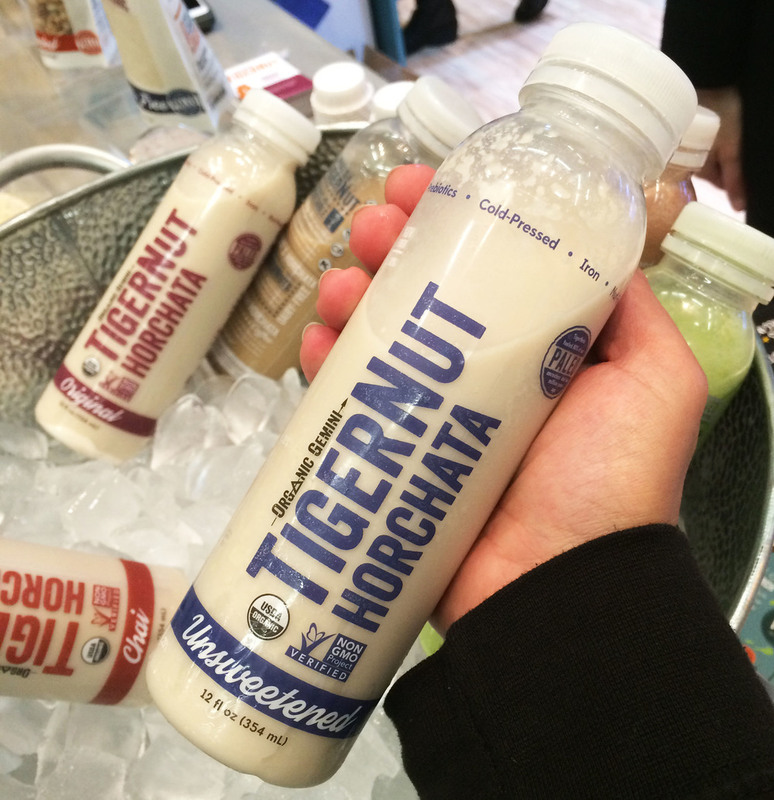 So Delicious / How does one stand out at a tradeshow? Bring your own airstream and serve ice cream that's how! So Delicious's ice cream game continues to rule above the rest. Their options are creamy and decadent, which for me, is exactly what I want in my splurge. Their new Chocolate Cookies N Cream has everything you'd want in a chocolate treat; flavor, texture and rich. Way Better Snacks / I love my chips. They are my guiltiest of pleasures. I can take down a whole bag if left to my own devices. These days are options don't have to break the bank in calories and crappy ingredients. We can have sprouted, nutritious, full of flavor chips that work by themselves or with delicious dips. My go-to option is Sweet Potato, but Mustard & Onion is a close second. As well, keep your eyes open because they are rolling out new package designs! Taza Chocolate / Unrefined, stone-ground, organic chocolate; yeah, that's the good stuff. I remember the days when I use to see a few flavors from Taza, but now they have grown by leaps and bounds! I love a pure dark chocolate, but I also love the occasional Gingerbread Cookie, Eggnog and Salted Almond. Their new "crunch" line–mini chocolates with brown rice crisps; are delicious and easy to take with for a quick treat. Every movie theater should be stacked with them! Brad's Raw Chips / New packaging and a somewhat reformulated recipe has made this one of the better-packaged kale chips I've had. The kale chip revolution at expo has calmed down, but the tried and true's are still going strong. Hilary's Eat Well / Whole ingredients, tasty flavor combinations and an awesome staff make Hilary's my favorite frozen patty on the market. Now they are rolling out new bites, dressings and packaging! If you can't tell by the picture, the Mediterranean won me over. Lucky Foods / Stopped in ones tracks by spring rolls?? 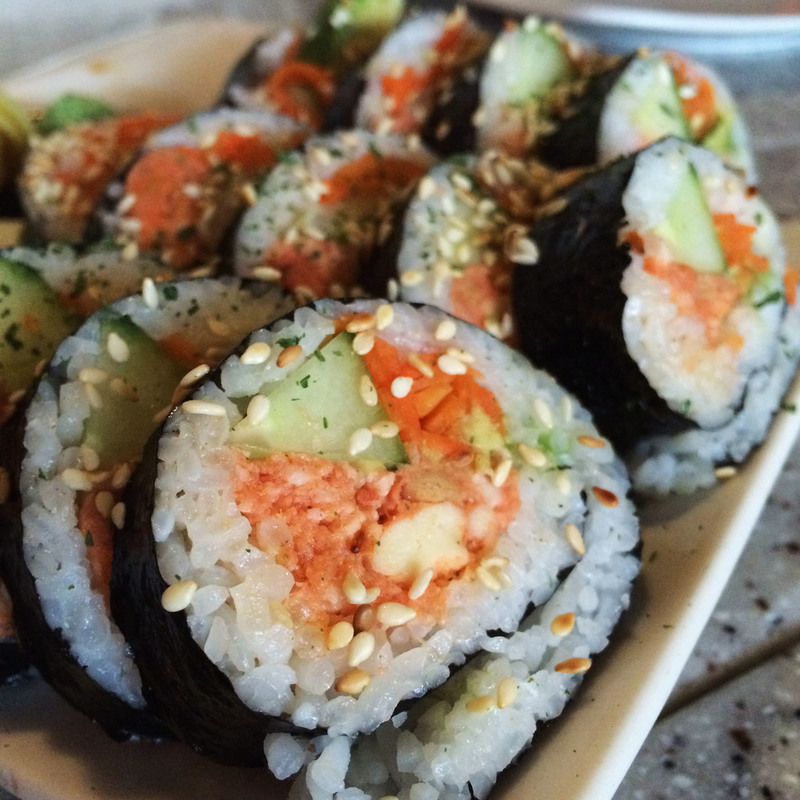 I especially was because it's not often that one comes across gluten-free spring rolls. They were delicious, flaky, flavorful and light. I was sold! After our last day at expo, I was exhausted beyond belief. My body was jello and my brain was mush YET a post-expo meal to finish the weekend was still in store. 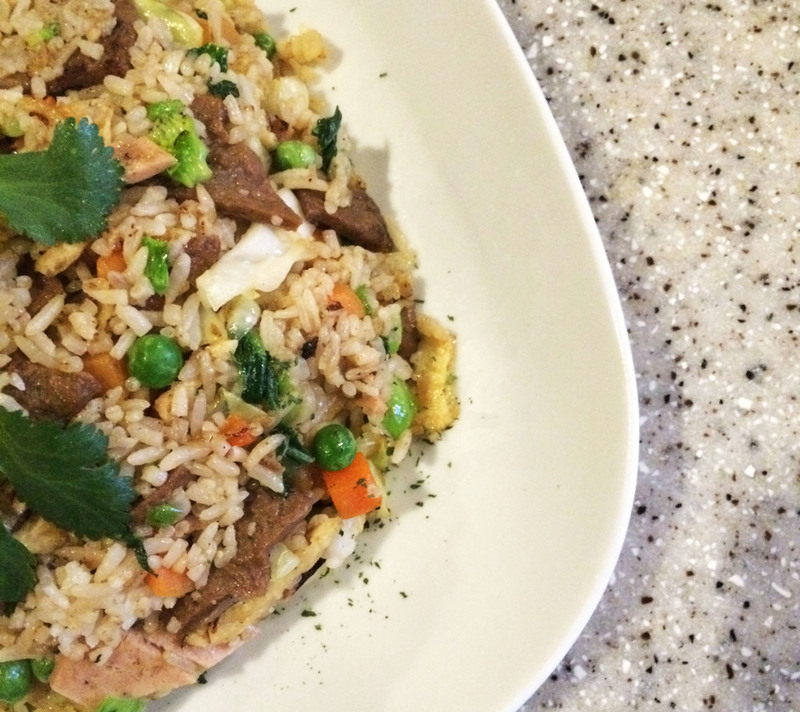 We met at Mitasie 3 in Huntington Beach for a family style Vietnamese feast. Two favorite dishes to start were the spicy soy tuna roll and da bomb fries. Both outstanding in supplying me with delicious comfort food. Three dishes to follow were the mango salad, fried rice and salt pepper tofu. Again, all great comfort food dishes that hit the spot. Thisistheveganlife knows how to order family style! She nailed it for this group. It was the perfect end to a packed weekend.